GregMalnar.jpgThat Big!Probably discussing the size of rats in Nam. 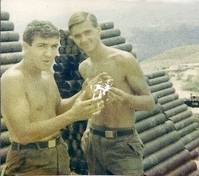 PFC Gregory J. Malnar with fellow redleg Sp4 Craig W. Faurot while at LZ Mile High with "A" Battery. Time frame is late 1967.